Enjoy! We appreciate that you’ve chosen to dine with us. If there is something special you need, just ask. If there’s something not to your liking, let us know and we’ll fix it for you right away. It’s the Cattlemens Way — a tradition that began 50 years ago…“It was my first ranch, a nice little place…,” Cattlemens founder Pete Gillham Sr. remembered fondly, “I had about 1,000 head of longhorn, and of course, Pete Jr. was born there.” Pete Sr. grew up on his dad’s ranch near Tucson, Arizona and in 1937 he bought his first ranch — the U Circle in the foothills of the Catalina Mountains near Oracle, Arizona. At one point in the 50’s, he managed a ranch that ran over 15,000 head of cattle! “I knew there was great beef out there, and I was always puzzled (and a little peeved) that you couldn’t find it in restaurants.” So in the mid-1960’s, both Pete Sr. and Jr. set out to learn the restaurant business. 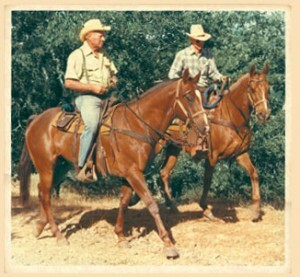 In 1968 they opened the first Cattlemens and brought their rancher’s straightforwardness to the restaurant business. Today Pete Jr. presides over eight Cattlemens restaurants. You’ll find the same straightforward Western Hospitality and great food regardless of which Cattlemens you visit. Though Pete Sr. has passed on, his legacy and kind spirit are still with us today, and a big part of who we are. Thank you. Please come back soon and “I’d rather be in the saddle, with the sun on my back, than just about anywhere else on this earth,” Cattlemens founder Pete Gillham Sr. used to say. At left, Pete Sr. ‘n Pete Jr. circa 1970 bring more of your partners with you! Cattlemens is owned and operated by a ranching family — offering old-fashioned True Western Hospitality — great food, served with a smile, in an authentic environment. There’s no substitute for the best. Cattlemens’ Pete Sr. and Pete Jr. and the Cattlemens team are “mighty picky” — personally selecting the best ingredients for decades. Aging beef used to be a common practice, but in today’s busy world it’s become a lost art. At Cattlemens we age our own beef in a carefully controlled environment until it’s just right. Simply put, pre-cut steaks just don’t taste as good. So at Cattlemens, we have experts on site to hand-cut our steaks, the same day that we serve them! To make your dining experience distinctive, we’ve re-created the “feel and flavor” of the Old West, using authentic antiques and incorporating local color whenever possible.